Physical rehabilitation is utterly crucial recover and cure sports injuries, which can deteriorate the quality of your life if left untreated. There could be several factors that lead to sports injuries such as improper training, lack of exercise specially warm-ups and use of inappropriate shoes and clothes. Proper training and right kinds of exercises are extremely crucial for professional athletes, otherwise, they won’t be able to prevent potential injuries. As a professional athlete if you fail to take your physical fitness seriously you could face a lot of difficulties in your career. Your injuries can prevent you from taking part in your favorite sporting event – which hurts a lot. Right? In fact, there are a lot of chances of your career getting over if you fail to live up to the expectations of your team members and fans. So, you have to be physically fit all the time to focus on your game and to give your hundred percent. Some of the most common sports injuries that affect athletes frequently include fractures, knee injuries, ankle sprains, muscle strains, shin splints. However, if you work on your physical fitness you can easily avoid some of these injuries. It is quite true that a person with strong physical fitness can easily recover from these conditions when compared to those with poor fitness. Physical therapy is the most appropriate way to deal with sports injuries because physical therapists try to heal your condition in a natural way. They don’t use medications and surgical treatments to heal your injuries, so you don’t have to be bothered about the side effects. In short, physical therapy is the most cost-effective, pain-free and drug-free methods of treating sports injuries. Here are some of the common sports injuries which must be treated with physical therapy. Ankle sprains are extremely common in athletes and they lead to a lot of pain and discomfort. It’s a condition that occurs when you injure your ankle while running, and jumping. So, whether you are a runner or someone who plays games like soccer, volleyball, basketball, and badminton you have to be very careful about the way you move your body and place your feet on the ground while running and jumping. An ankle sprain occurs when you overstretch a ligament or tear it down. It causes a lot of pain. If you are observing stiffness, itching, bruising and swelling in your ankle after twisting it, then you could be suffering from an ankle sprain. Ankle sprains can be divided into different grades such as grade 1, grade 2 and grade 3 based on the severity of the injury to your ligament. When you simply overstretch your ankle ligament and get a mild pain then your condition can be categorized under grade 1. On the other hand, when you partially tear your ankle ligament and get prolonged pain then your condition can fit under grade 2. However, when your ligament is torn fully and you experience severe pain and swelling for a prolonged time then your problem can be categorized under grade 3. You should consult a PT for both grade 2 and grade 3 conditions. They will teach you effective exercises to subside your pain and to accelerate the healing process. They may use techniques like Kinesio Taping and dry needling to speed up the natural healing mechanism of your body and to curb pain and swelling. The best part consulting a physical therapist is that they will figure out the exact location of the injury to heal your pain. Shin splints is a pain that is felt by people along the shinbone. 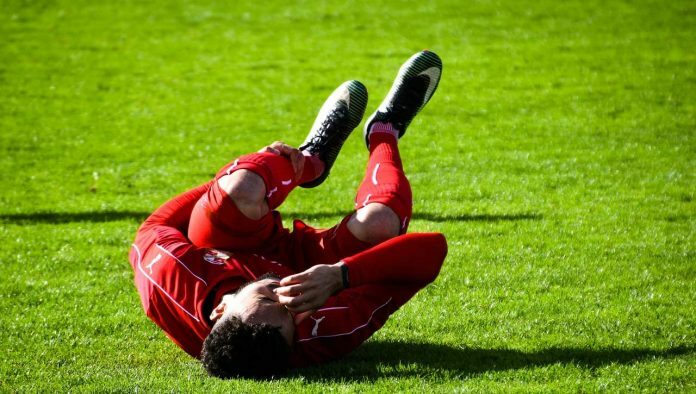 It occurs when you put a lot of pressure on your shinbone while running or playing a game. If you are experiencing severe pain, then it’s better to consult a physical therapist. They will try to identify the actual cause of your pain and will treat your condition accordingly. Shin splints also called medial tibial stress syndrome, is typically caused by uncomfortable shoes, flat feet, and weak ankle. Knee injuries can have a great impact on the careers of the athletes. It can restrict them from focusing on their game and reduce their performance to a great extent. So, if you have injured your knee recently, make sure that you consult a competent physical therapist immediately. Back pain is also a common condition that affects a large number of athletes. Sprains and strains are the common causes of back pain and they can be easily treated with physical therapy. So, if you want to improve your physical fitness and performance take physical therapy services from a reliable clinic in your area.